The story goes something like this.. There was once this town, within which there was a forest. In that forest lived a tiny little rabbit called bunny rabbit. Next to this bunny rabbit's house there was a carrot field. Every morning, bunny rabbit gets up and peeps out of his window to look at the carrot. The field will be full of carrot. Out it rushes to brush his teeth and jumps out of the window to eat all the carrots. Now this farmer was very angry because everyday his crop is eaten by this naughty rabbit. One day he decides to stay put on his field hoping to catch his rabbit. He has a big stick and stands near the entrance. Bunny rabbit wakes up and as routine peeps out of the window. Ohh!, he gets a shock seeing the farmer. He thinks! !..what shall I do??. I have no carrot to eat, and I am so hungry?. IDeeaa! !, off he goes with a long rope. He goes and hides behind a huge tree and spreads his both hands out. The farmer wondering why this rabbit has not come, sees the hands and is curious. He goes to the tree wondering what the hand like thing is popping out. He touches the right hand and suddenly luckc luckc..his hands are tied, shocked he touches the left hand and luckc luckc his left hand is tried. Out pops the rabbit with a big sack on his shoulder. He laughs at the farmer and runs into the field. He pops all the carrot and eats to his full. His eyes sparkle as Stars. He fills the rest in the sack and walks ohay hoi ohay hoi...with a majestic stride, looking at the farmer with pitiful look. Well all my stories to her has to begin with okka Ooru (in one town) and I make sure it ends with "the subject finally going to sleep". This story, is also one that I use to bribe her to eat carrots. 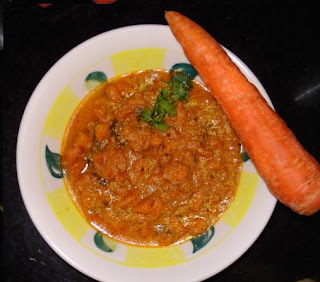 Carrot Kurma was introduced to me by Athamma. 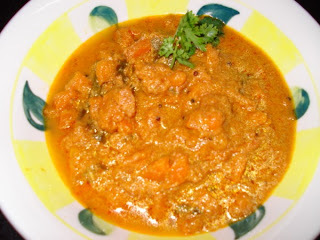 We normally make Tomato Kurma for Dosas. But hubby dear was trilled to tell me that his mom makes Carrot Kura for Dosas. Well when I first had this, I was taken over by this combi. And everytime I make it, hubby dear never fails to mention that this was his fav. Heat Oil in a cooker, add onions, clove, cinnamon, ginger garlic paste. Cook till onions are brown. Then add tomatoes, add salt, Once its soft and well cooked, add chilli pw, coriander pw, turmeric pw. Cook on high flame and simmer for 5 mins till the oil comes out. Then add carrot, fry for few mins. Then add coconut paste and water. Cover with lid and pressure cook it for 2 whistles. Remover and cook if excess water. Garnish with Coriander leaves. This goes excellent with Crispy Dosa or Kal Dosas also. Well just thought the picture will look prettier with a carrot!